I wonder if it's because of the wound from yesterday. My right arm's still hurting." I murmur while getting up. I jump out of my futon and change instantly. Fuji-Nee and Sakura have morning practice. They'll be leaving here around six-thirty, so I won't make it unless I hurry. "Yes. Please be careful yourself as well. Do not do anything reckless, even if you may be with Rin." "Yeah, I learned that yesterday. I'll ask for your help if I'm to go after an enemy." I get myself mentally ready as I go down the hill. 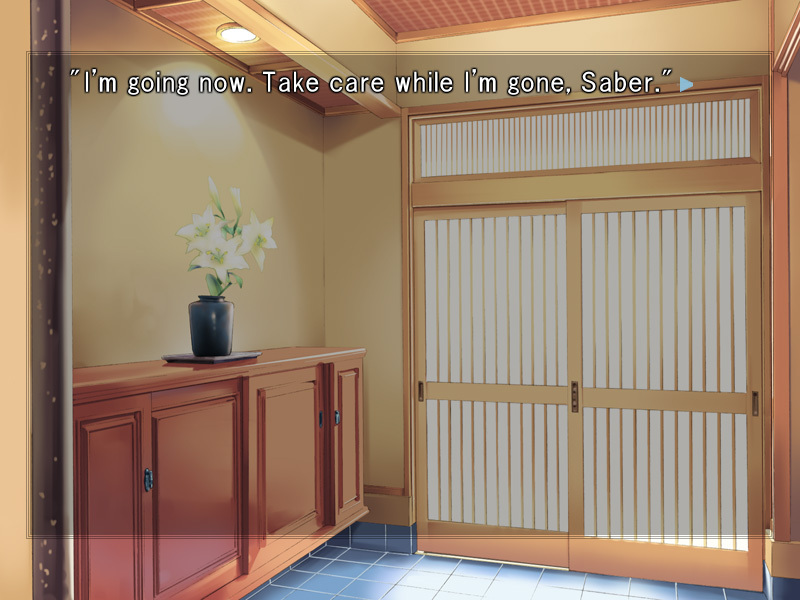 Tohsaka's acting like a Master, so I should act as one too. I don't need to think. I run straight to Shinji. 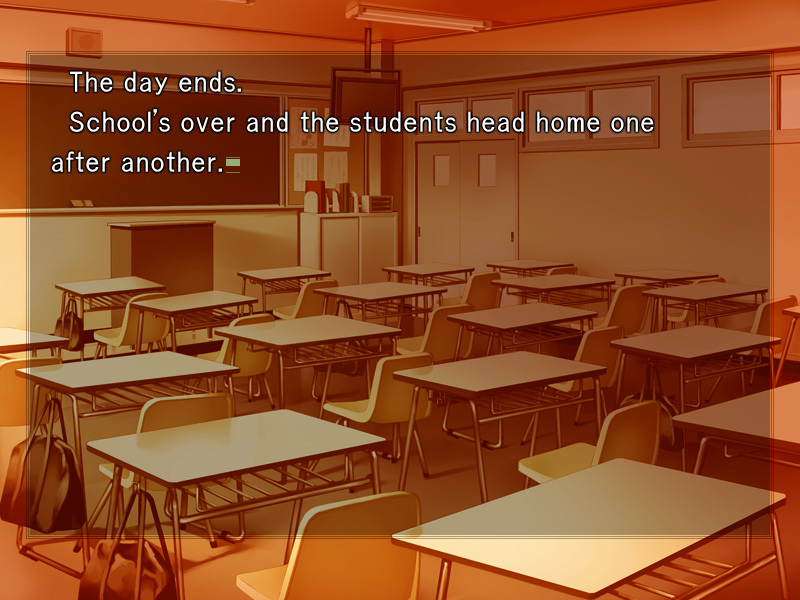 "Hey, Emiya. What's going on? You're looking pretty dangerous. Did something happen to you while I was gone?" "Shut up. What did you do to Mitsuzuri?" "Mitsuzuri ? Oh, Ayako. I heard she ran away. I heard about it in the range this morning. So she was found in Shinto, huh?" I don't know what's funny, but Shinji laughs. It looks like he's sneering at her. Don't play dumb. You're the last one that talked to her. I'm asking you what you did to her then." 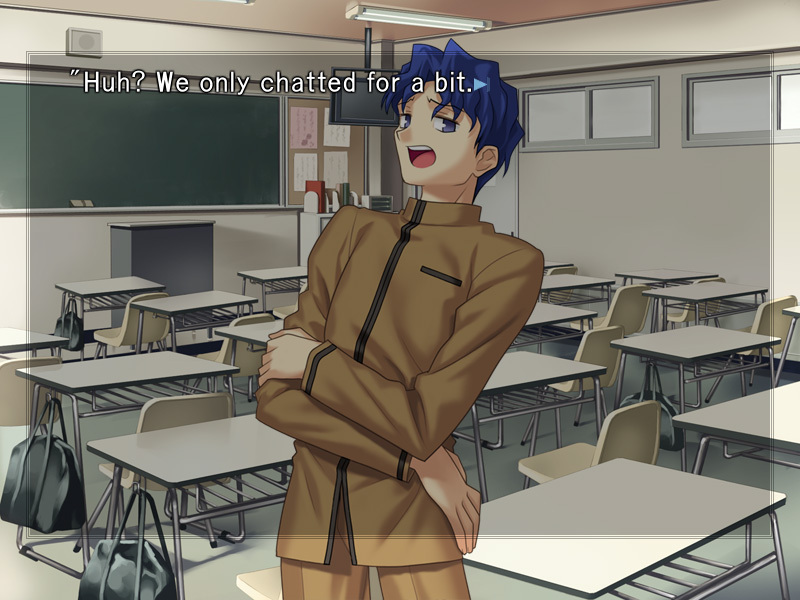 More importantly, did you hear about it, Emiya!? Ayako was fucked up in the back alley! It must've been rough! I heard her eyes were spaced out and her uniform was messed up. Well, I don't know what happened, but it's not something I can ignore, right? I'm kind of curious how that conceited girl got trashed." "Why the angry face? It's just a joke. Ayako's under care now, right? I think she's staying at her house now. 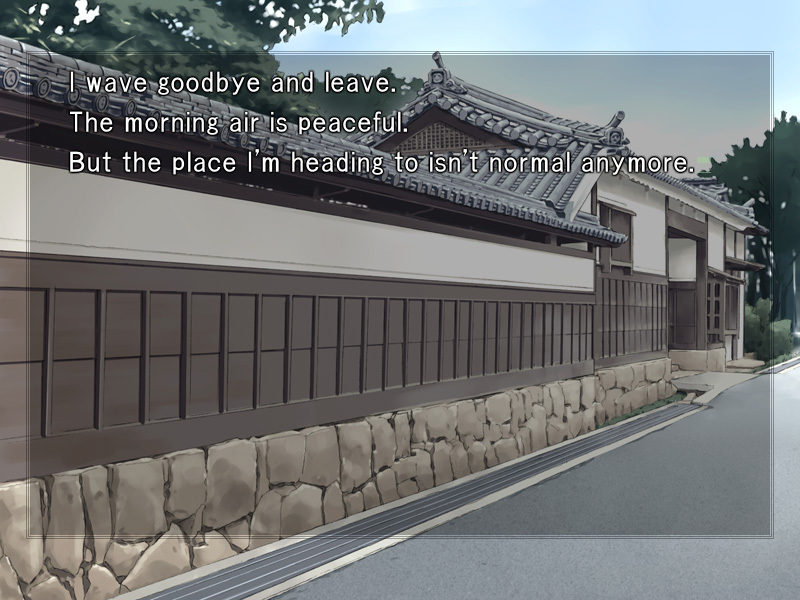 Well, I guess it'll be harder for her once she comes back, because the rumor will have spread by then." " Shinji. Are you saying you told everyone at the archery range about this?" "Maybe. But all the first years know about it already. I hear the rumor's been flying around since yesterday." Did he go around and tell everyone such a story? Mitsuzuri is a girl. Everyone thinks she's strong, but she's still a girl. So no matter how strong she is, it'll destroy her if such a rumor is spreading. And he still spread the rumor in spite of that? He took a secret and spread it irresponsibly !? "Don't glare at me like that. I said I don't know anything about it. You'll regret it if you hit me for selfish reasons." 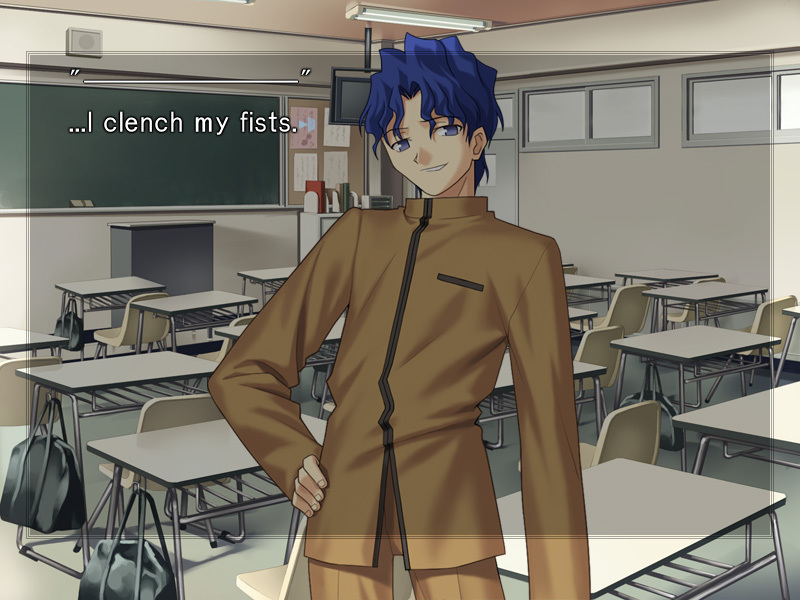 Shaking my hand off, Shinji goes to sit down. I could have questioned Shinji, but I don't have any proof right now. Even if I told him about seeing him in the woods yesterday, it would amount to nothing if he tells me he just happened to be there. I have to find proof first." I don't know if he's a Master or not. But I'm sure he has something to do with Mitsuzuri's case. I can only strip them and look for the Command Spell, huh?" Well, I'm sure no Master's going to allow me to do that.
" It's almost time. 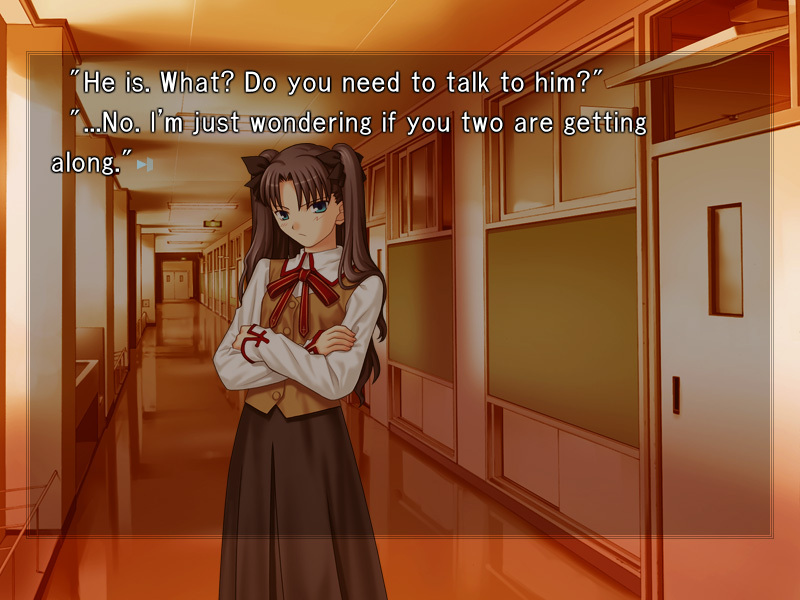 Tohsaka might know of a good way." 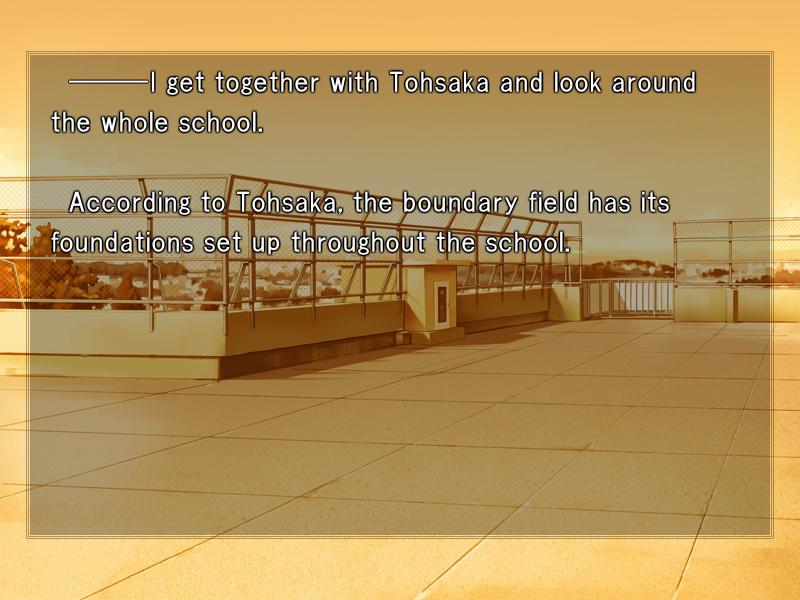 I promised Tohsaka I'd meet her in the hallway after school. Tohsaka's been searching and erasing them, but it seems they keep coming back up or new ones are created, preventing Tohsaka from completely eliminating the boundary field. "The boundary field's already set up. What I'm doing is weakening the effect. It's better than nothing, and I'm sure the Master won't activate it until it's complete." That's the case according to her. "Tohsaka. Can I ask you something?" 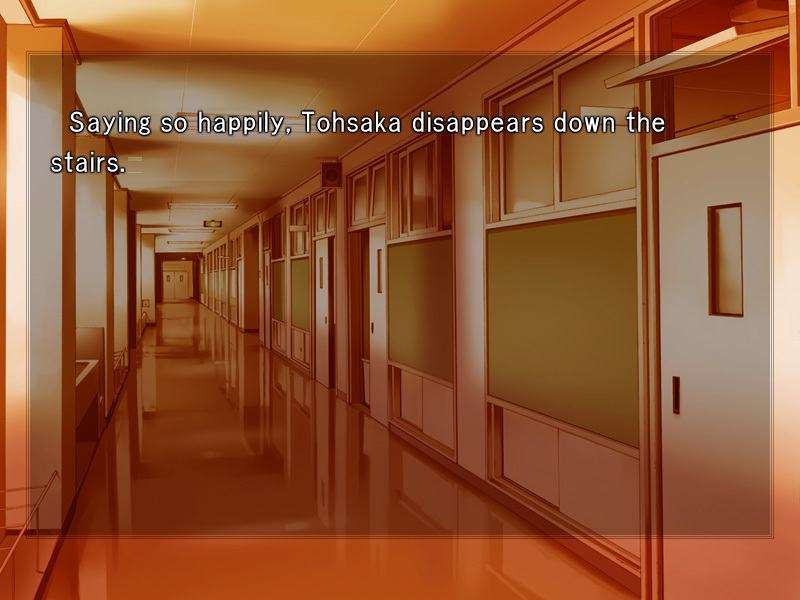 I call out to Tohsaka after she eliminates the mark on the rooftop. "Oh no, this is about a different matter. I don't feel anything strange here now. I can't feel anything." "I see. I guess we've erased all the active marks now. You can't sense magical energy, but you're really sensitive to abnormality in the air. I didn't think I'd be able to erase all the marks so fast." Since I forgot that this scene even existed, I already posted the anime version of this while on the Fate path. Tohsaka's in a good mood. I'm happy I got to be of help, but this is no time for that. "Tohsaka. Can Masters recognize other Masters? Does their presence change even if their Servant is in spirit form?" yes, you can identify a Master if he hasn't done anything to hide it." "All Masters are magi, so you can find them if you follow the magical energy. Additionally, they've formed a contract with a great familiar called a Servant, so their magical energy will leak even if they hide it." "You haven't noticed since you're slow, but I leave magical energy behind me. A magus would know right away I'm a Master, and I'm sure I can recognize another Master if I see him or her." !? But you didn't know I was a magus. Why is that?" "What? You want me to say it?" "No, it's fine. I think I figured it out." "Smart move. Well, that's how it is. There are people who have small amounts of magical energy that aren't magi. Magi approve others as magi only when they have more than a set amount of magical energy." "Yeah, yeah. I figured that out. Oh, then what do you feel from me now?" I heard it was an incomplete summoning, so I bet the connection between you two is small except when healing your wounds. Well, I guess that's possible since you're a special case." Then Shinji isn't a Master. 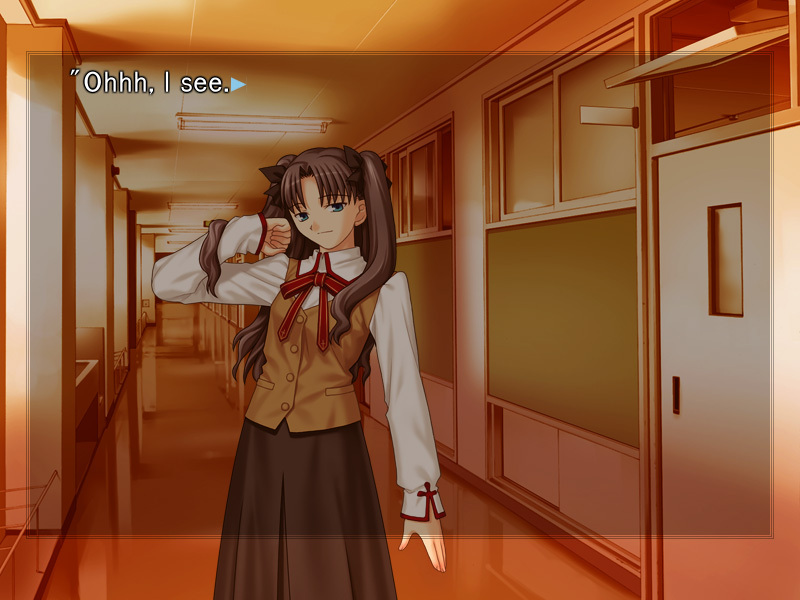 Even if I can't tell, Tohsaka can identify a Master. 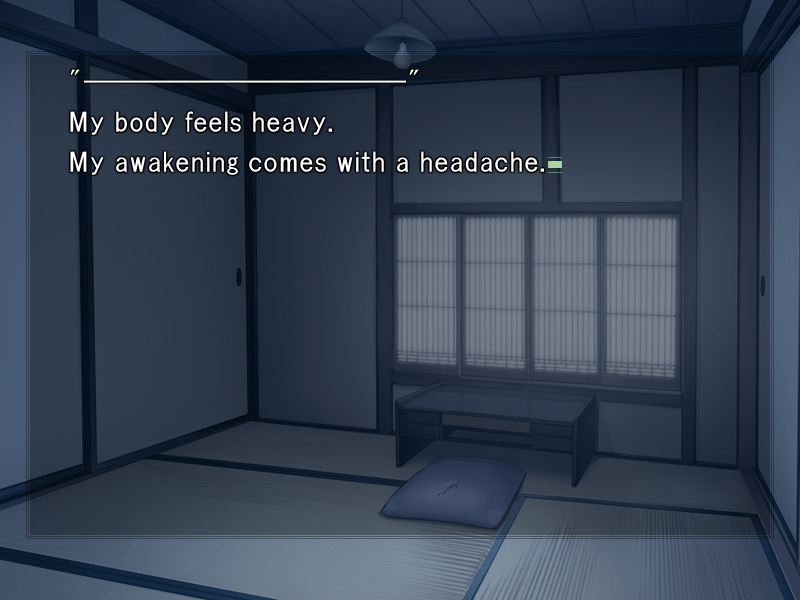 Tohsaka should be able to feel the lingering magical energy if Shinji is a Master with a Servant. "Oh. You say we have to look for Masters, but it should be easy once we start. We just need to follow the trail of magical energy, right?" "That's not true. If they have an item that can hide their magical energy, nobody would find out about them. Well, I think items that can hide a magical energy as large as a Servant are rare, so I don't think any Master has one." "Then you can't detect a Master even if he's close to you, if he has such an item?" "Hmm. It would depend on what he has, but I think I'd be able to tell if I go near him. As long as they've formed a contract with a Servant, friction with the world will occur." "If I can't identify a Master even when I'm near him, it means that the Master isn't using his Servant. Well, I guess there are exceptions, but that'll be the case nine times out of ten." "You're patient. You don't know how long it'll be before that happens, right?" "Really? A person who would set up a boundary field like this won't just stay quiet if something like this happens. I'm guessing he or she will come out tomorrow. This person won't let the same thing happen twice." 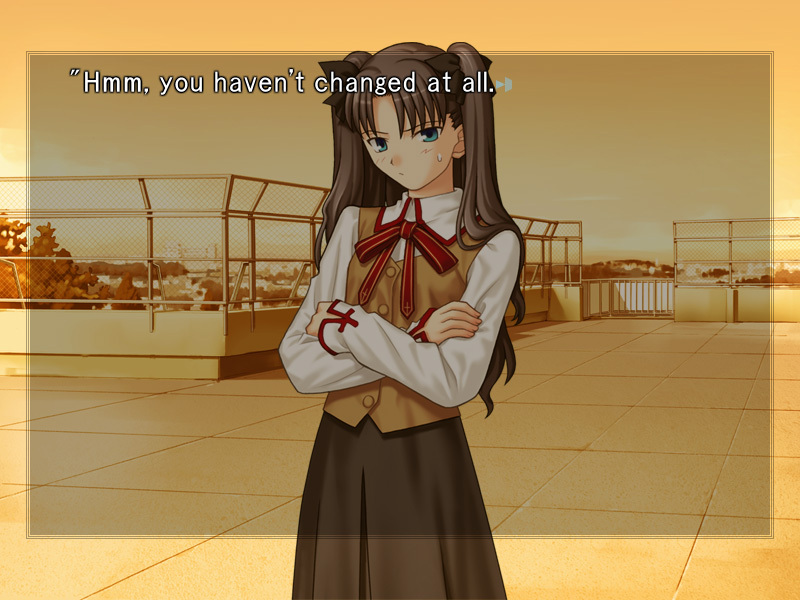 Tohsaka sneers at the Master we have yet to see. "Hmm. So that's how it is?" "Yup. Well, I have some things to do, so I'll be going home now. I have to buy a lot of stuff in preparation for tomorrow." "I'll see you tomorrow. Go home early today, okay? Go straight home." "Hm? Oh, you're worrying about me?"
! N-No, it just screws up my plans if my ally dies! I'm just making sure!" Her panic is so unlike her, and it's obvious that she's only hiding her embarrassment. 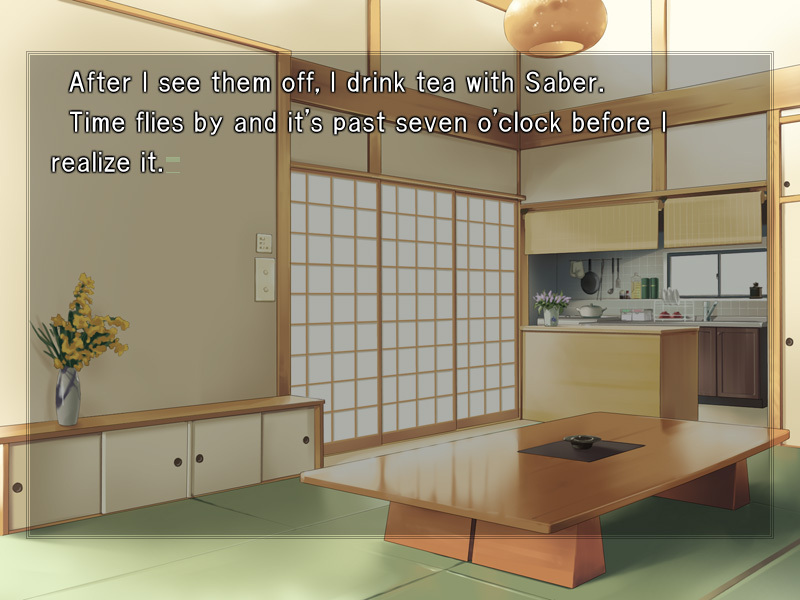 I'm beginning to understand more about Tohsaka. "Anyway! You're too defenseless, so don't do careless things! I'm an exception, but other Masters will kill you in a matter of seconds!" Tohsaka looks away and tries to leave. "Tohsaka. Is Archer by your side?" 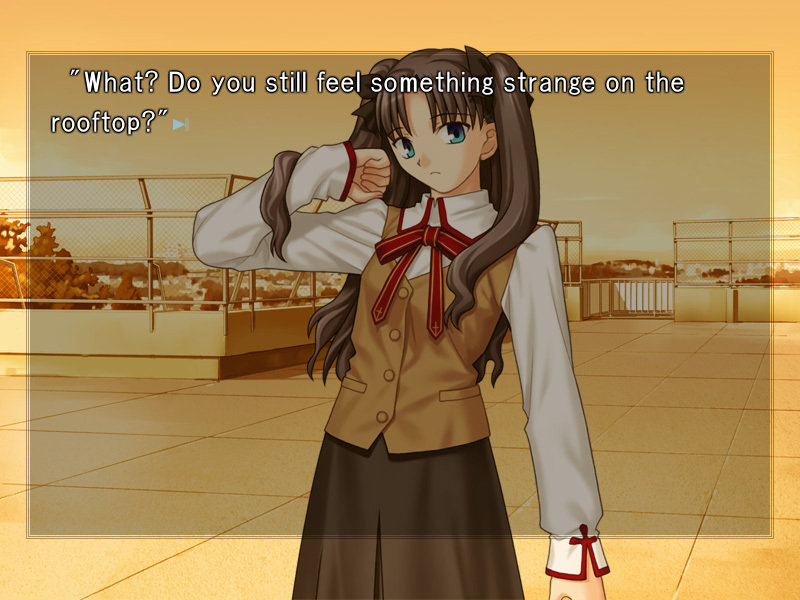 Tohsaka looks back at me in wonder at the sudden question. 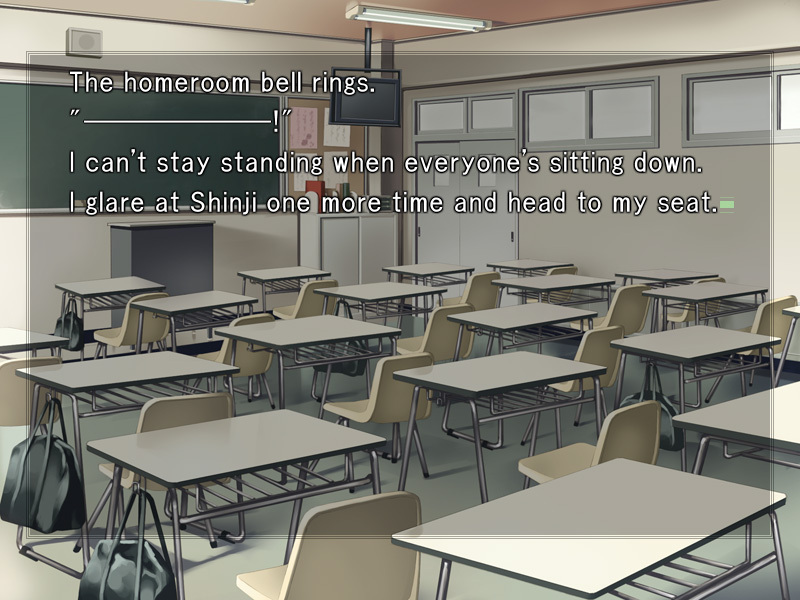 This is the exact moment that Rin figured out Shirou is gay. You don't need to worry. He's a good guy even though he's rebellious. He's immature in spite of his looks, and he's fun to be with."